HID Global announced a wafer-thin high temperature UHF label designed to make RFID tracking reliable and affordable in the automotive industry and other industrial applications involving very high temperature and various challenging environmental factors. HID Global’s High Temperature Label has a thickness of just 0.5 mm, but is capable of surviving extremely harsh conditions maintaining excellent read performance. The product can endure long-term exposure to very high temperature, for instance 140°C for 400 hours or 230°C for 20 hours, is rated UL 94 V-0 against flames, withstands diverse chemicals, high pressure, repeated bending and torsion, moisture and prolonged immersion in water. Moreover, being originally developed to track work in process parts in automotive manufacturing, the HID Global High Temperature Label resists welding operations, autoclave sterilizations, anti-corrosive electrolyte baths, cycles of paint layer application, stages in drying ovens at temperature exceeding 200°C. Engineered to last all the lifetime of automotive components, the product can be used by automakers to manage recall events. The HID Global High Temperature Label is recommended also for tracking industrial tools, medical trays, heavy equipment, aerospace components, cargo containers, blade and rack servers in data centers, other applications that require an ultra-thin UHF label that must survive very high temperature. This EPC Class 1 Gen 2 RFID tag leverages the Impinj Monza 4QT chip and is available in a single global-use version that provides read range up to 8 meters on non-metallic surfaces. The HID Global High Temperature Label can be mounted with screws or rivets. Self-adhesive on the back is offered as an option. The standard footprint is 80 mm x 50 mm, but custom dimensions can be provided by HID Global in order to meet specific customer needs. The High Temperature Label can be supplied pre-programmed and laser engraved with barcodes, logos or human-readable data. 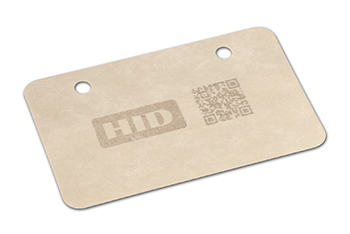 Please contact HID Global for more information on this high temperature UHF RFID label for the automotive industry and other industrial applications. Are you seeking RFID tags for other applications or looking for complete RFID solutions? Try our RFID tag search engine or contact us.